The GGX is a grease removal device. It traps grease and skims it away. It can be installed under wash up sinks in busy kitchens or in basements. Traditional grease traps must be pumped out when it is 25% full of grease. Because the X-Series removes the grease automatically, it doesn’t need to be pumped out regularly. Waste enters the unit from the back and solid food waste is immediately captured in a dry solids basket. The remaining grease and fats continue into the main separation chamber. The solids filter can be easily removed from the front of the GGX and disposed of into the trash. There is no need to open the main lid. Grease separates in the main tank and settles on the surface. trapped behind a baffle wall. The grease is then skimmed away after being first heated. The treated effluent is allowed to continue down the drain. 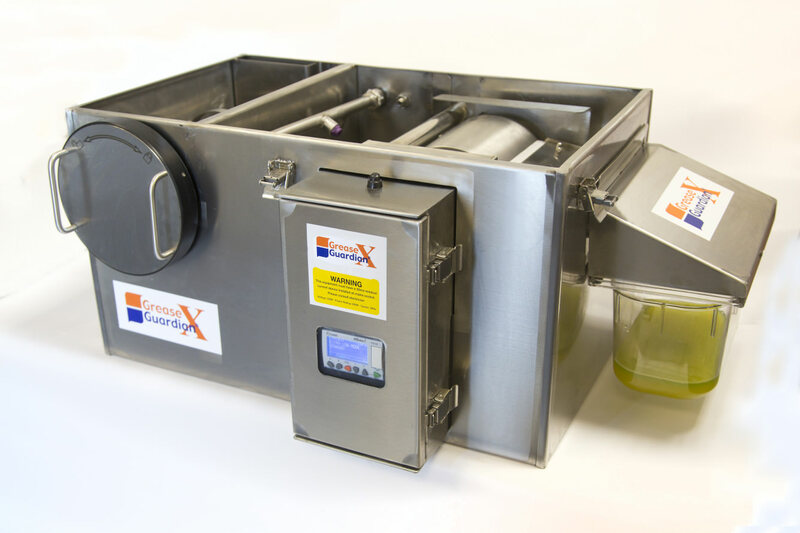 The skimmed grease is deposited into a grease bucket at the side of the unit which can be easily removed. Grease can be taken away for recycling by approved FOG rendering companies.